We came home from our month-long adventures in southern Asia to a mystery box with a handwritten note in Japanese. 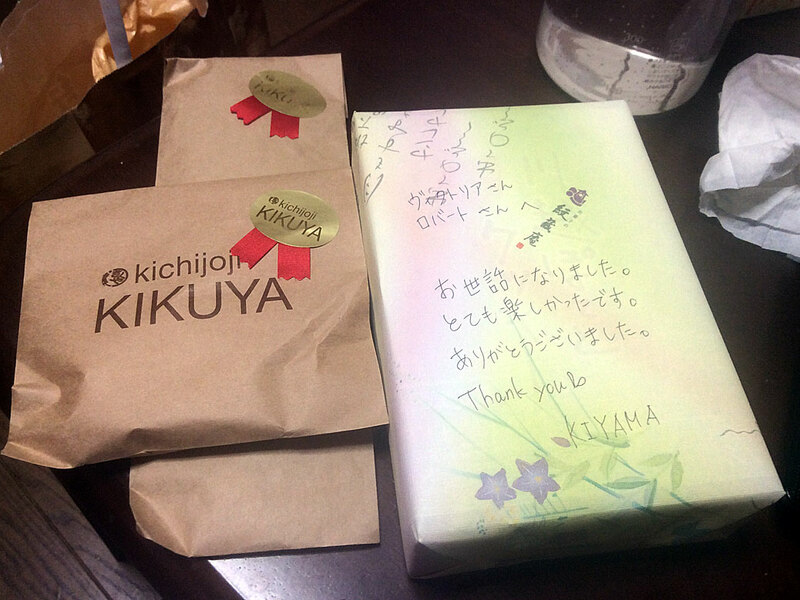 Inside were two pairs of nice chopsticks and chopstick rests and a box of Kawagoe sweet potato cookies. A gift from our neighbors indicated that they’d moved away… sad! Sadly, the note indicated that our downstairs neighbors had moved away while we were gone. 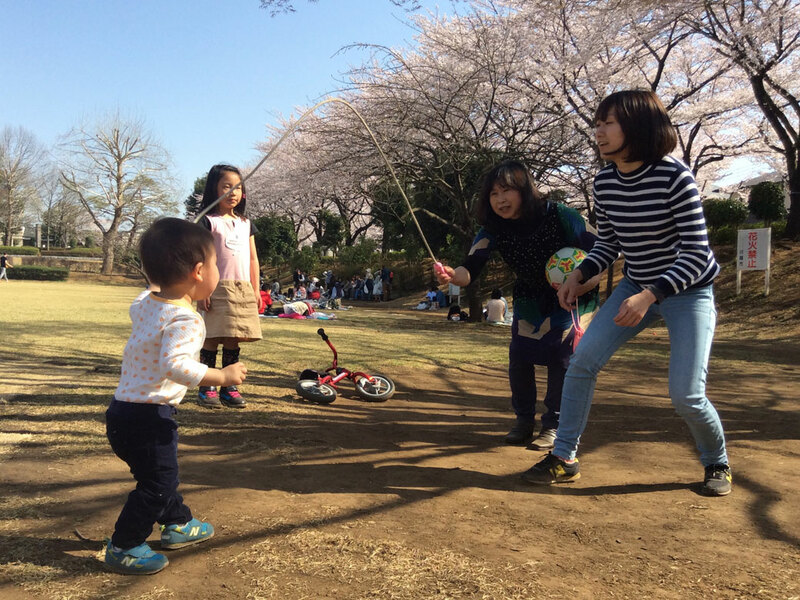 While the majority of our interactions with Tomoko and her girls consisted of a simple “Konnichiwa” (今日は – Hello) in passing, the kids had warmed up a bit after we gave them the traditional New Year’s gift of otoshidama. They were great neighbors and we wanted to figure out a way to thank them for the gift. We headed to our rental company and asked if they had a forwarding address. Unfortunately, they did not, but thanks to cell phones, a person’s phone number doesn’t always change with a move. I left my e-mail address with the rental company who promised to try and contact Tomoko for us. A few days later, an e-mail from Tomoko popped up in my inbox. I thanked her for the gift and asked her to say hello to the girls for us. I figured that’d be it… maybe we’d exchange e-mails occasionally. Over the weekend, I received another e-mail from Tomoko. 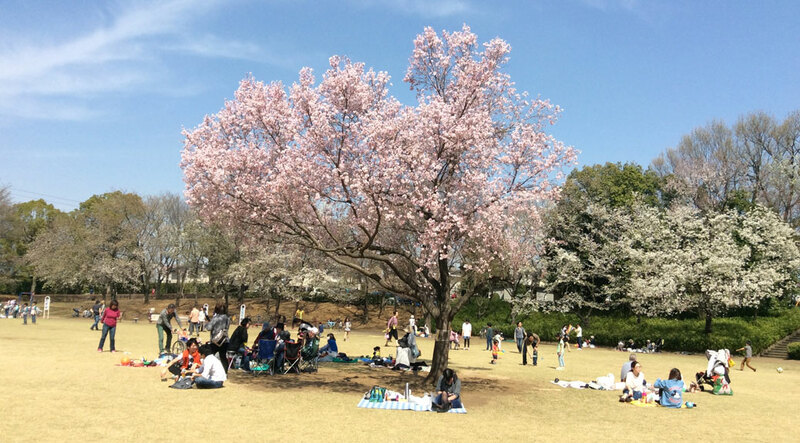 She invited us to join her for hanami (cherry blossom viewing) at the park near our house. We accepted the invite, albeit with some nervousness about having enough Japanese to carry on a conversation. The day came and we headed down to the park armed with brownies, potato chips and some grocery-store sushi. Although it was a Tuesday, the park was packed. 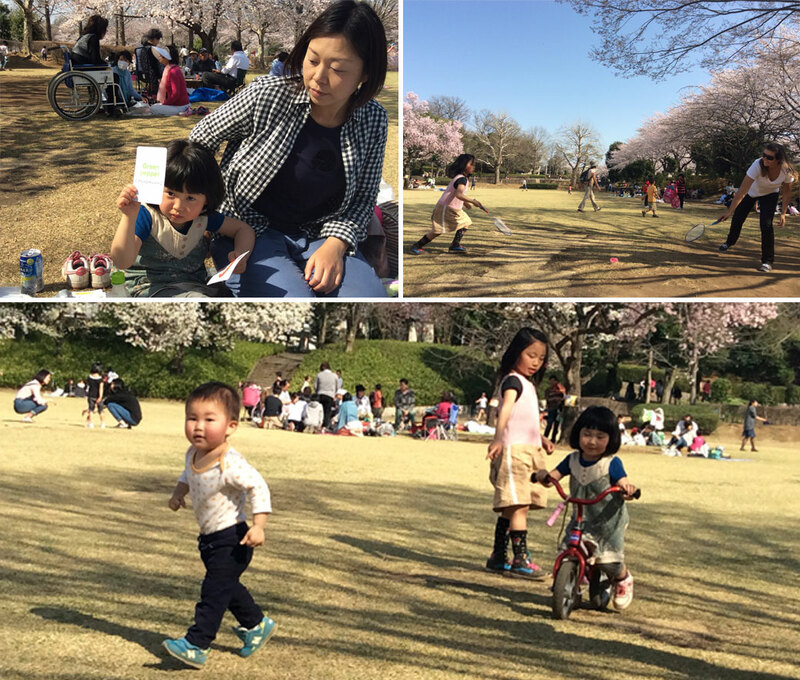 Turns out it’s spring break week, so all of the kids are out of school and families are taking advantage of the good weather to get their hanami on. After a few minutes of scanning the crowd, Tomoko’s oldest daughter Kano came running over to us. We soon saw Tomoko and the rest of her group. 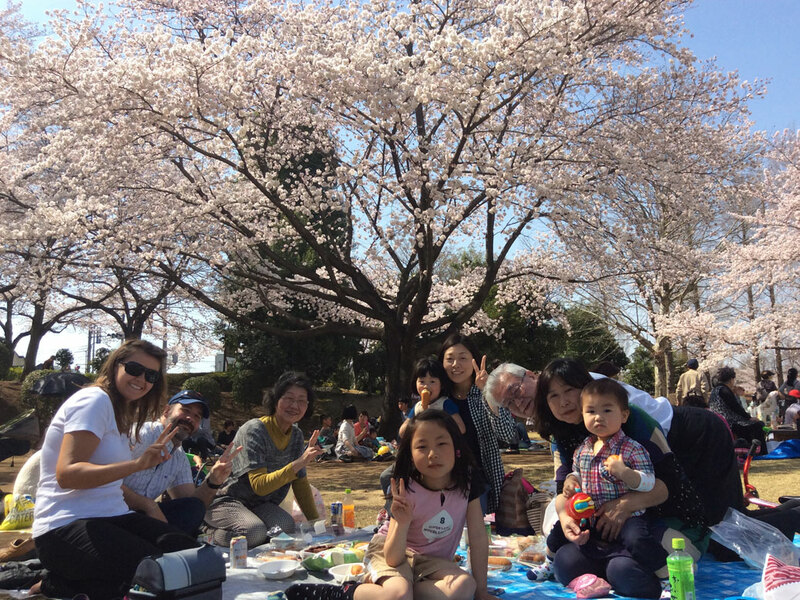 We’d been invited to the family hanami! Tomoko (back middle) and her wonderful family… and us! Admittedly, I didn’t catch how everyone was related. The older man is an English teacher at a local high school and clearly had been giving some lessons to the rest of his family. Everyone took turns asking questions and we were able to have some really nice conversations as everyone bounced between English and Japanese. 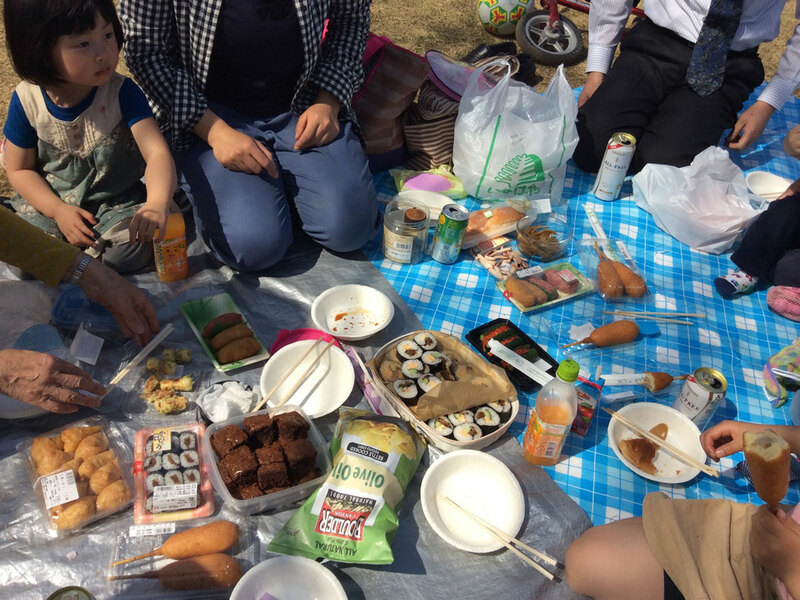 Hanami picnics are like ground buffets. Everyone brings a lot of food and share it potluck style. Tomoko’s mom made sushi rolls and pickled gobou (ごぼう). Gobou is the Japanese word for burdock root—which we weren’t familiar with at all before coming to Japan—and is included as a side dish in a lot of meals. Inari sushi (seasoned rice wrapped in tofu skin) is a popular snack, and they won the day bringing “sakura inari,” colored a dull pinkish color by adding cinnamon. The kids were enjoying the corn dogs, of course. After lunch, all the kids—young and old—took some time to play. The little boy, KenKen, was adorable, serious and adept at finding the camera with his chubby, round face. At just 18 months old, he’d already figured out how to swing a jump rope and play with his cousins. Tomoko’s youngest daughter, Hasumi, sat quietly during lunch, asking us to read her English flash cards. While she learned English words for her vegetables, we learned some new Japanese words at the same time. After a couple hours, with full bellies and full hearts, it was time to go. 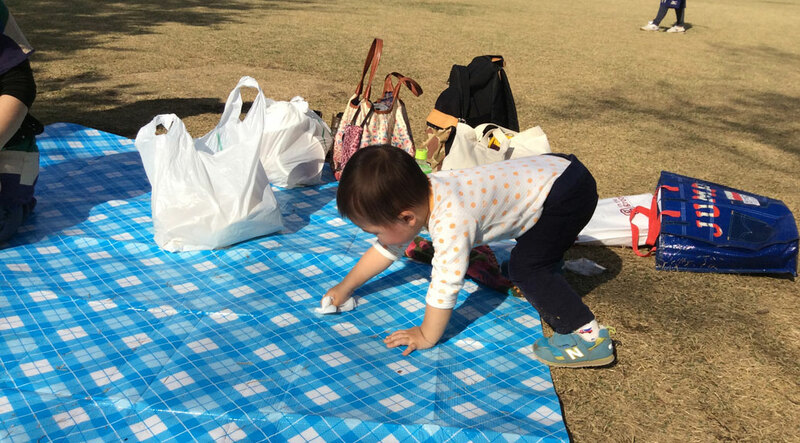 Japanese children learn the custom of cleanliness at an early age. As we packed up the tarp, KenKen grabbed his little towel and started cleaning up the loose grass from the tarp. Tomoko’s mom loaded us up with leftovers which provided two more meals. We made them take the brownies, which they gladly did. We started towards home, the group waving and saying good-bye. It’s not always easy to put yourself out there in Japan, but there’s yet to be a time where it’s failed to become a great memory. We’re grateful to Tomoko and her family for accepting us into their family tradition. Kawagoe Spring Festival kicked off on March 28 and will continue until early May with events sprinkled throughout the month of April. We took our new GoPro camera along for opening weekend to capture some of the sights and sounds. Enjoy! The most lasting impressions of all the trips we’ve taken are not the things we saw, but the people we met. So glad you are having that kind of experience.